This Japanese Chirimen shoelaces are unique and fashionable and make a big difference. Strong and durable. No color fading nor shirinking even after wash. Length 117cm(46inch), which is suitable for 5-6 shoe eyelet spacing. Width 1cm. 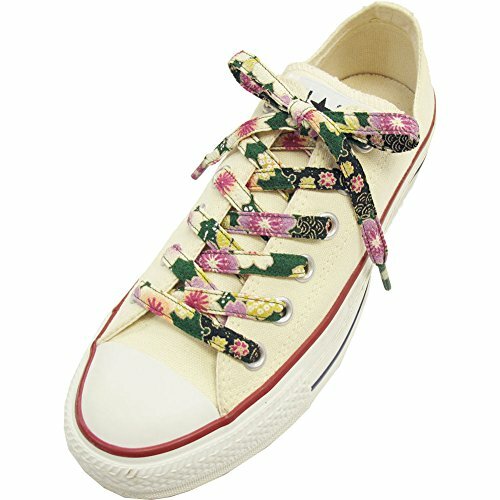 Fashionable shoelaces for sneakers made with Chirimen cloth, Japanese traditional Kimono fabric. Length 117cm (46 inch), which is suitable for 5-6 shoe eyelet spacing. Width 1cm (0.4inch). Strong and durable. No color fading nor shirinking even after wash.
1 Pair (2 laces). Material: Chirimen cloth. As chirimen print Japanese kimono cloth is used, the color/design varies one by one. You can't choose. If you have any questions about this product by Cocoluck, contact us by completing and submitting the form below. If you are looking for a specif part number, please include it with your message.